Sage Line 500 reporting is faster and simpler with this solution based on our ELT Data Warehouse automation software, ZAP Data Hub. Optimized for Sage Line 500, it automates data access, integration and preparation. Sage Line 500 is ERP and business management/accounting software covering financials, commercials and manufacturing. But, due to the complex nature of data and its limited reporting functionality, it can be difficult to produce reporting from such a sophisticated system. ZAP Data Hub’s specifically-optimized reporting solution makes it fast and simple to report from Sage Line 500 thanks to smart data connectors, pre-built data model and analytics. ZAP Data Hub’s Sage Line 500 reporting solution supports all version of Sage Line 500, as well as its latest incarnation, Sage 1000. For businesses considering migrating from one version of Sage to another, ZAP Data Hub will help maintain reporting continuity. ZAP Data Hub stores data from Sage Line 500 in a structure that makes it available for historical reporting alongside data from a new ERP. ZAP Data Hub is ELT data warehouse automation software. It removes the time-consuming and labor intensive need to prepare data for reporting manually. ZAP Data Hub automatically accesses Sage Line 500 data, integrates it with other data, if required, and prepares it in a structure that is optimized for financial and operational reporting. ZAP Data Hub automates reporting from Sage Line 500. Relying on people to prepare data for business reporting significantly increases the risk of critical decisions being made on inaccurate, ungoverned data. It also heightens the possibility of key-man dependencies arising, that can impact reporting continuity. ZAP Data Hub’s Sage Line 500 reporting solution significantly reduces these risks by removing the need for human intervention in the reporting process. If your business is running or has more than one instance Sage Line 500 – perhaps across multiple offices or sister companies – ZAP Data Hub will automatically integrate and unify each instance to provide cross-functional reporting. As well as Sage Line 500, ZAP Data Hub is also optimized for all other Sage systems, as well as Microsoft Dynamics, Salesforce, SAP Business One and SYSPRO, with pre- built connectors for over 100 other financial systems and databases, too. ZAP Data Hub’s Sage Line 500 solution can connect to cloud and on-premises installations. Additional data sources – again, either cloud or on-premises – can also integrated for enhanced, consolidated BI reporting. 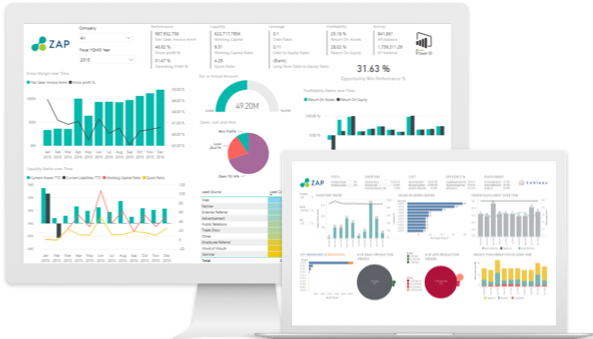 Deliver consistent, accurate, trusted financial and operational reporting from Line 500 in Power BI. ZAP Data Hub access and structures Line 500 data in a data warehouse for faster, simpler reporting in Power BI. ZAP is a Tableau Technology partner. ZAP Data Hub makes reporting in Tableau from Line 500 a breeze. ZAP Data Hub’s smart data connector and pre-built data model for Line 500 automates data preparation for Tableau. If you use Qlik Sense, the fastest and easiest way to report from Line 500 is with ZAP Data Hub. It is especially useful if Qlik is one of a number of BI systems in use or if you are moving from one system to another.